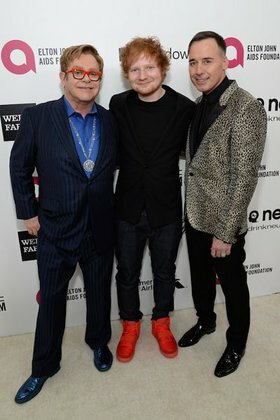 The 22nd annual Elton John AIDS Foundation Academy Awards Viewing Party hosted by Sir Elton John and David Furnish raised $5.1 million for the fight against HIV/AIDS. The gala, which took place on Sunday, March 2, at West Hollywood Park in Los Angeles, was co-sponsored by Chopard, Neuro Drinks, and Wells Fargo. Attendees included Sir Elton John and David Furnish, Alex Pettyfer, Angela Lindvall, Ann Wilson & Nancy Wilson, Anna Paquin & Stephen Moyer, Asher Monroe, Ashley Greene, Austin Butler, Bernie Taupin, Britney Spears, Carmen Electra, Chace Crawford, Cheryl Burke, Cheyenne Jackson, Chris Colfer, Christina Hendricks, Colton Haynes, Dave Franco, David Burtka & Neil Patrick Harris, Donatella Versace, Dwight Yoakam, Ed Sheeran, Ellen Pompeo, Eric McCormack, Gordon Ramsay, Heidi Klum, Irina Shayk, Jane Fonda, Jane Seymour, JC Chasez, Jessica White, Joe Jonas, John Waters, Johnny Weir, Jonathan Groff, Josh Groban, Karina Smirnoff, Karolina Kurkova, Kellan Lutz, Kelly Osbourne, Kelly Rowland, Kelsey Scott, Kenny “Babyface” Edmond, Khloe Kardashian, Kim Kardashian, Kourtney Kardashian, Kris Jenner, Kristin Cavallari, Lady Gaga, Lance Bass, Laura Prepon, Laura Vandervoort, Mel B, Nikki Reed, Ozzy Osbourne & Sharon Osbourne, Paz Vega, Paulina Rubio, Petra Nemcova, Quincy Jones, Rob Minkoff, Robert De Niro & Grace Hightower, Robert Kraft, Ryan Kwanten, Sam Trammell, Sandra Lee, Sarah Hyland, Sheryl Crow, Skylar Grey, Steven Tyler, Tara Lipinski, Taylor Swift, Tim & Jane Allen, Tommy & Dee Hilfiger, Tony Goldwyn, Vanessa Hudgens, and Whoopi Goldberg, among others. Guests arrived at the Academy Awards Viewing Party for cocktails followed by a gala dinner and viewing of the 86th Academy Awards telecast. For a second consecutive year, Chef Gordon Ramsay, British celebrity chef, television personality, restaurateur, and holder of 14 Michelin stars, prepared an exquisite 5-course meal for guests. The dinner was followed by a lively auction. Auction items included tickets to the Broadway performance of Hedwig and the Angry Inch with a backstage tour and drinks with the show’s star Neil Patrick Harris, a print of Elton John and John Lennon taken in 1974 and signed by the photographer Bob Gruen, a portrait sitting with photographer Catherine Opie, five days at Steven Tyler’s Hawaiian retreat, tickets to the 2014 Vanity Fair Oscar Party, and a piano signed by Elton John and Bernie Taupin. Following the auction, British singer-songwriter Ed Sheeran took the stage to perform several songs, including “The A Team,” “Lego House” and a special duet with Elton John of “Candle in the Wind,” much to the crowd’s delight. In his remarks for the evening, EJAF Founder Sir Elton John thanked his guests for enthusiastically participating in the evening’s new audience participation feature, which enabled guests to make gifts to the Foundation on the spot using their cell phones. Throughout the evening, video messages from long-time EJAF supporters Ellen DeGeneres and Anderson Cooper, as well as live messages from EJAF friends Heidi Klum and Eric McCormack encouraged guests to text in pledges in support of the Foundation’s urgent mission. Audi and MAC Viva Glam supported the event as Co-Sponsors. American Airlines continued to serve as the Foundation’s official sponsoring airline.